Piedmont Park, known to many as the “crown jewel” of Atlanta, hosts many large events right across the street from Grady, such as the Dogwood Festival in April and Music Midtown in September. While many students attend these popular events, few know about some of the smaller-scale festivals that also call Piedmont Park home. On Aug. 18 and 19, the Piedmont Park Summer Arts and Crafts Festival brought the community together to show off some of the best art from around the Southeast. 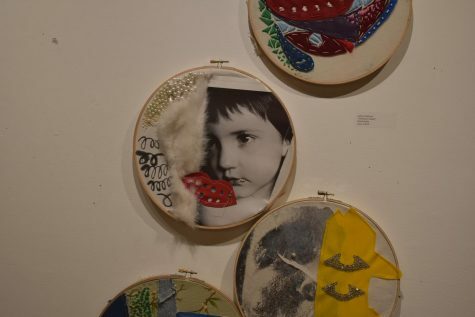 The festival, organized by the Atlanta Foundation for Public Spaces, featured more than 200 artists, including painters, photographers, glass blowers, jewelers, sculptors and crafters. Festival director Patrick Dennis believes the festival brought a unique flair to Piedmont Park that was unlike most other festivals held in the popular space. Dennis, who is an artist himself, said the festival prides itself in being “by artists, for artists.” He wants the festival attendees to realize what the Atlanta art community has to offer, and hopes this festival’s extreme friendliness will appeal to customers. The Summer Arts and Crafts Festival had some distinct qualities that set it apart from other Atlanta festivals, such as its unusually small size. This festival received less publicity than other Piedmont Park events and featured about 230 artists, drawing a crowd of 47,000 people over the weekend. The Dogwood festival only has a few more art booths but draws crowds of hundreds of thousands of people. Dennis said attendees like this smaller festival because afterwards they don’t feel like they missed anything. Despite its lower attendance, the Piedmont Park Summer Arts and Crafts Festival was not lacking in diversity of art. It included everything from jewelry to organic honey to homemade African masks and infrared photography. 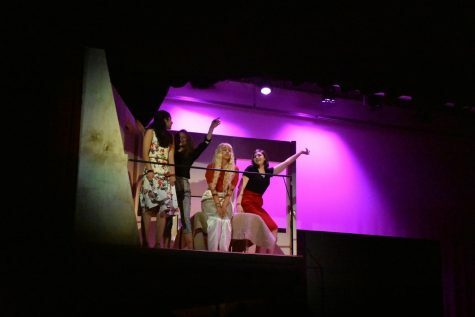 After they applied, the artists at the festival were chosen to participate by a jury. Kathy Walton, a vendor at the festival who partcipates in many of the foundation’s festivals, specializes in recyclable metal lawn decorations. “All of my work is recycled, so it is green, and it is whimsical and fun,” Walton said. Freshmen Jordan Schuster and Tessa Szalkowski were at the festival volunteering for 21st Century Leaders, sitting in for vendors who had to momentarily leave their booths. In between their shifts of booth-sitting, they were able to tour the grounds, and both said they enjoyed the variety of art at the festival. “One guy shot me with a marshmallow gun,” Schuster joked. Jasomat Patel traveled from Alachua, Fla., to Piedmont Park to sell carnivorous, bug-eating “pitcher plants” at the festival. She said she looked on the festival website, and saw that the festival was in a park, which attracted her to come to Atlanta. “I love the parks, so that was the first selling point,” Patel said. Another aspect that differentiates this festival from traditional Atlanta festivals is its use of food trucks. Instead of funnel cakes and corn dogs, this festival offered a choice of exotic and creative cuisine, including Korean-Mexican fusion, wood-fired pizza, gourmet grilled cheese, traditional barbeque and specialty French fries. “They have healthy alternatives to fast food,” Dennis said. “[Traditional festival food] is fun to eat, but the after-effects are not so good. Each year, proceeds from the festival are donated to a different charity. The festival has not designated a primary charity for this year yet, but it had donated some money before the event even started. “We have already contributed some of the proceeds . 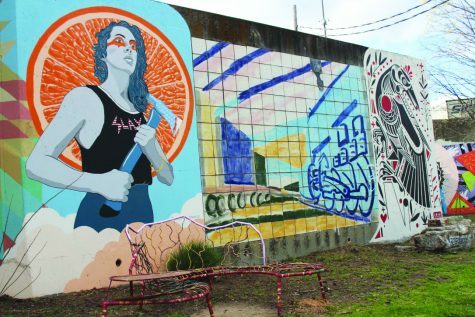 . . to the Georgia Foundation for Public Spaces, which provides scholarships to artists in need,” Dennis said. The festival also included a street magician, multiple Ping-Pong tables, a kids’ play area and a dog adoption agency. 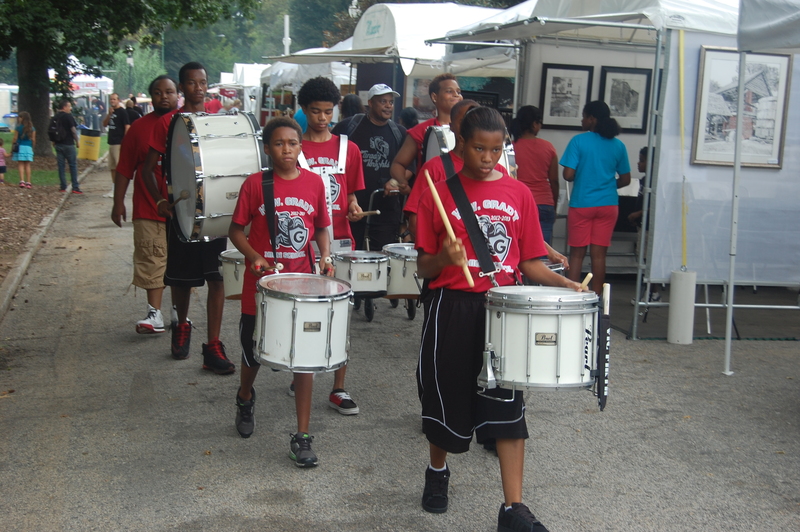 In addition, the Grady drum line opened the festival on Saturday by marching around the entire festival, bringing an energetic atmosphere that lasted the whole weekend. Special education teacher Brian Leahy came with his wife, Jenny Leahy, to the festival because they live across the street from the park. Brian Leahy said that compared to the Dogwood Festival, the Summer Arts and Crafts Festival was more consistent with its name. “Unlike the Dogwood Festival, we can bring our dog to this one,” he said. This festival was a rain-or-shine event, and Dennis said the vendors had to bring plastic sheets to cover their tent if it rained. Fortunately, these sheets were put to minimal use. After a light shower at around 11:45 on Saturday, the sun came out for the rest of the weekend. Though the festival did not have quite as many attendees as some other Piedmont Park events, this year’s Summer Arts and Crafts Festival still attracted almost 50,000 people to Atlanta’s crown jewel, where they could enjoy their day, appreciate a large variety of art from around the Southeast and get some personal attention along the way.